Bar Harbor New England Fish Chowder 15 oz. 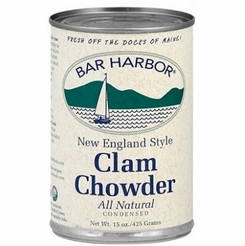 Home / Pantry Items / Clam Cake Mixes/Clam Chowders & Quahogs / Bar Harbor New England Fish Chowder 15 oz. 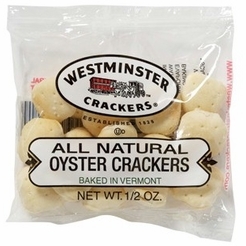 Home / New England Classics / Clam Cake Mixes/Clam Chowders & Quahogs / Bar Harbor New England Fish Chowder 15 oz. Home / Hot GIFT Ideas / Gifts For Him / Clam Cake Mixes/Clam Chowders & Quahogs / Bar Harbor New England Fish Chowder 15 oz. Home / Specialty Grocery / Clam Cake Mixes/Clam Chowders & Quahogs / Bar Harbor New England Fish Chowder 15 oz. Home / Pantry Items / Condiments, Sauces, Dressings, & More / Clam Cake Mixes/Clam Chowders & Quahogs / Bar Harbor New England Fish Chowder 15 oz. Home / New England Classics / Condiments, Sauces, Dressings, & More / Clam Cake Mixes/Clam Chowders & Quahogs / Bar Harbor New England Fish Chowder 15 oz. 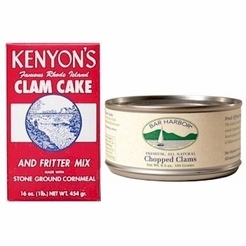 Home / Hot GIFT Ideas / Gifts For Him / Party Favorites / Condiments, Sauces, Dressings, & More / Clam Cake Mixes/Clam Chowders & Quahogs / Bar Harbor New England Fish Chowder 15 oz. Home / BBQ & Grilling / Condiments, Sauces, Dressings, & More / Clam Cake Mixes/Clam Chowders & Quahogs / Bar Harbor New England Fish Chowder 15 oz. Home / Hot GIFT Ideas / BBQ & Grilling / Condiments, Sauces, Dressings, & More / Clam Cake Mixes/Clam Chowders & Quahogs / Bar Harbor New England Fish Chowder 15 oz. Home / Hot GIFT Ideas / Gifts For Him / Party Favorites / BBQ & Grilling / Condiments, Sauces, Dressings, & More / Clam Cake Mixes/Clam Chowders & Quahogs / Bar Harbor New England Fish Chowder 15 oz. Home / Specialty Grocery / Condiments, Sauces, Dressings, & More / Clam Cake Mixes/Clam Chowders & Quahogs / Bar Harbor New England Fish Chowder 15 oz. Home / Foods of New England / Condiments, Sauces, Dressings, & More / Clam Cake Mixes/Clam Chowders & Quahogs / Bar Harbor New England Fish Chowder 15 oz. Home / Foods of New England / Clam Cake Mixes/Clam Chowders & Quahogs / Bar Harbor New England Fish Chowder 15 oz. Home / Pantry Items / Meats & Seafood / Clam Cake Mixes/Clam Chowders & Quahogs / Bar Harbor New England Fish Chowder 15 oz. Home / New England Classics / Meats & Seafood / Clam Cake Mixes/Clam Chowders & Quahogs / Bar Harbor New England Fish Chowder 15 oz. Home / Hot GIFT Ideas / Gifts For Him / Meats & Seafood / Clam Cake Mixes/Clam Chowders & Quahogs / Bar Harbor New England Fish Chowder 15 oz. Home / Foods of New England / Meats & Seafood / Clam Cake Mixes/Clam Chowders & Quahogs / Bar Harbor New England Fish Chowder 15 oz. Home / Meats & Seafood / Clam Cake Mixes/Clam Chowders & Quahogs / Bar Harbor New England Fish Chowder 15 oz. Home / Specialty Grocery / Meats & Seafood / Clam Cake Mixes/Clam Chowders & Quahogs / Bar Harbor New England Fish Chowder 15 oz. Home / Hot GIFT Ideas / Gifts For Him / Party Favorites / Meats & Seafood / Clam Cake Mixes/Clam Chowders & Quahogs / Bar Harbor New England Fish Chowder 15 oz. Home / New England Classics / Clambake & Seafood / Clam Cake Mixes/Clam Chowders & Quahogs / Bar Harbor New England Fish Chowder 15 oz. Home / Foods of New England / Clambake & Seafood / Clam Cake Mixes/Clam Chowders & Quahogs / Bar Harbor New England Fish Chowder 15 oz. Home / BBQ & Grilling / Clambake & Seafood / Clam Cake Mixes/Clam Chowders & Quahogs / Bar Harbor New England Fish Chowder 15 oz. Home / Hot GIFT Ideas / BBQ & Grilling / Clambake & Seafood / Clam Cake Mixes/Clam Chowders & Quahogs / Bar Harbor New England Fish Chowder 15 oz. Home / Hot GIFT Ideas / Gifts For Him / Party Favorites / BBQ & Grilling / Clambake & Seafood / Clam Cake Mixes/Clam Chowders & Quahogs / Bar Harbor New England Fish Chowder 15 oz. Home / Pantry Items / Hometown Food Favorites / Clam Cake Mixes/Clam Chowders & Quahogs / Bar Harbor New England Fish Chowder 15 oz. Home / New England Classics / Hometown Food Favorites / Clam Cake Mixes/Clam Chowders & Quahogs / Bar Harbor New England Fish Chowder 15 oz. Home / Foods of New England / Hometown Food Favorites / Clam Cake Mixes/Clam Chowders & Quahogs / Bar Harbor New England Fish Chowder 15 oz. Home / Specialty Grocery / Hometown Food Favorites / Clam Cake Mixes/Clam Chowders & Quahogs / Bar Harbor New England Fish Chowder 15 oz. Home / Local Portuguese Foods / Hometown Food Favorites / Clam Cake Mixes/Clam Chowders & Quahogs / Bar Harbor New England Fish Chowder 15 oz. Home / Pantry Items / Global Favorites / Local Portuguese Foods / Hometown Food Favorites / Clam Cake Mixes/Clam Chowders & Quahogs / Bar Harbor New England Fish Chowder 15 oz. Home / Specialty Grocery / Global Favorites / Local Portuguese Foods / Hometown Food Favorites / Clam Cake Mixes/Clam Chowders & Quahogs / Bar Harbor New England Fish Chowder 15 oz. 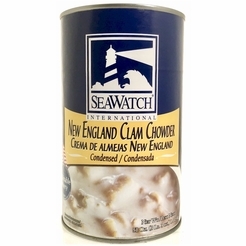 Home / Foods of New England / Local Portuguese Foods / Hometown Food Favorites / Clam Cake Mixes/Clam Chowders & Quahogs / Bar Harbor New England Fish Chowder 15 oz. Home / Hot GIFT Ideas / Holiday Entertaining / Clam Cake Mixes/Clam Chowders & Quahogs / Bar Harbor New England Fish Chowder 15 oz. Home / Hot GIFT Ideas / Gifts For Him / Party Favorites / Clam Cake Mixes/Clam Chowders & Quahogs / Bar Harbor New England Fish Chowder 15 oz. 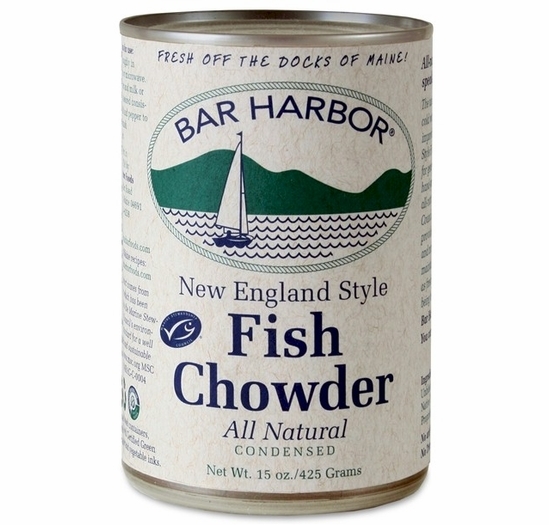 Home / Foods of New England / Brands (New England Favorites) / Bar Harbor / Bar Harbor New England Fish Chowder 15 oz. 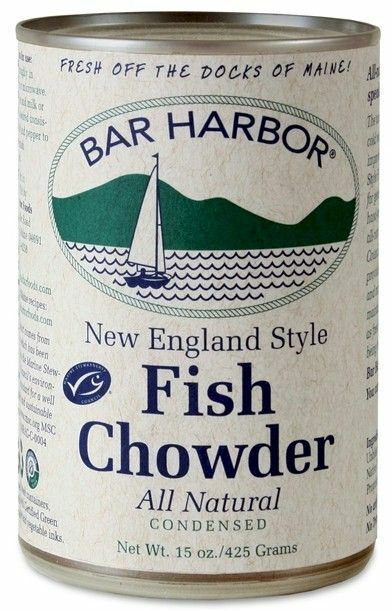 Home / Popular Brands / Bar Harbor / Bar Harbor New England Fish Chowder 15 oz. Home / Pantry Items / Condiments, Sauces, Dressings, & More / Soups & Chowders / Bar Harbor New England Fish Chowder 15 oz. Home / New England Classics / Condiments, Sauces, Dressings, & More / Soups & Chowders / Bar Harbor New England Fish Chowder 15 oz. Home / Hot GIFT Ideas / Gifts For Him / Party Favorites / Condiments, Sauces, Dressings, & More / Soups & Chowders / Bar Harbor New England Fish Chowder 15 oz. Home / BBQ & Grilling / Condiments, Sauces, Dressings, & More / Soups & Chowders / Bar Harbor New England Fish Chowder 15 oz. Home / Hot GIFT Ideas / BBQ & Grilling / Condiments, Sauces, Dressings, & More / Soups & Chowders / Bar Harbor New England Fish Chowder 15 oz. Home / Hot GIFT Ideas / Gifts For Him / Party Favorites / BBQ & Grilling / Condiments, Sauces, Dressings, & More / Soups & Chowders / Bar Harbor New England Fish Chowder 15 oz. Home / Specialty Grocery / Condiments, Sauces, Dressings, & More / Soups & Chowders / Bar Harbor New England Fish Chowder 15 oz. Home / Foods of New England / Condiments, Sauces, Dressings, & More / Soups & Chowders / Bar Harbor New England Fish Chowder 15 oz. Chowder is a Maine tradition and staple. When the temperature drops outside and the snow starts to fly, Maine families gather in their kitchens over comforting bowls of thick warm chowder, to catch up, share a story, or just to have a laugh. Bar Harbor's recipe has been fine-tuned over generations, passed down from mother to daughter, father to son. Their specialty seafood chowders are loaded with simple, easy to understand ingredients and chunks of fresh fish and seafood – the way any self-respecting chowder should be! Ingredients: MSC Alaskan Pollock, Potatoes, Water, Unbromated Wheat Flour, Butter, Native Tapioca Starch, Onions, Salt, Pepper & Proprietary Spice Blend. No artificial preservatives! No MSG! No Trans Fat! 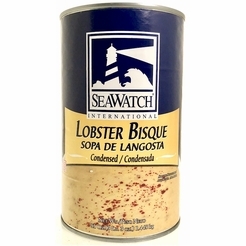 Seawatch Lobster Bisque 51 oz.